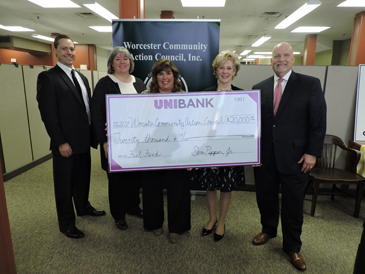 UniBank recently donated $20,000 to Worcester Community Action Council’s (WCAC) Low-Income Home Energy Assistance Program (LIHEAP), commonly known as the Emergency Fuel Fund. UniBank’s donation helps the WCAC provide relief to vulnerable households that are struggling to meet the cost of keeping their homes warm. WCAC’s Fuel Assistance Program helps eligible residents in greater Worcester, including many of the towns where UniBank has a presence. In addition, WCAC provides energy efficiency reviews for eligible households to help reduce costs and improve efficiencies to stretch energy dollars. The Worcester Community Action Council, Inc. was established in 1965 as the locally designated “community action” agency for the Economic Opportunity Act. Today, WCAC serves as an umbrella agency offering a variety of education, employment and social service programs. For more information about the LIHEAP or other services administered through WCAC, visit www.wcac.net.